Swiss manufacture Jaeger-LeCoultre at the annual exhibition SIHH 2012 introduced a new version of the legendary clock Grande Reverso – Blue Enamel (Ref. Q373 35 E1). Collection Grande Reverso, created in 1931 for the British polo players, has become one of the most popular in the range of the company. Last year, Swiss manufacture celebrated the 80th anniversary of the iconic clock with the body, the inversion and released several new models, which are easily recognizable “genetic code” of the collection. 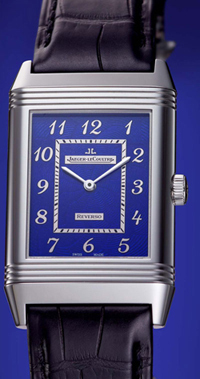 Designed by Grande Reverso models built on a combination of smooth lines and sharp geometric shapes: a rectangular enclosure, elegant fixtures, connecting strap and the body together. The technology, presented at the exhibition, has a relatively large enclosure (48.5 × 30 × 10.2), made of precious white gold. The elegant shape and silver color casing emphasize the beauty of monochrome enamel dial. Enamel is a bright blue color obtained by means of hot firing (at 800 ° C) and applied on the basis of the engraved white gold. When working with enamel, the master of the company are used as the basis for gold, which is not subject to oxidation and does not contain impurities that could eventually change the color of the enamel coating. On a blue enamel dial contrasts stand out Arabic digital markings and graded minute scale. Hours and minutes show the central arrow, no extra features. Watches are assembled on the basis of the manufacturing machinery with manual winding Jaeger-LeCoultre 822, consisting of 134 parts. Reliable and durable gauge works with the frequency of 21 600 pc / h, power reserve – 45 hours. Model released limited edition: buy a watch can only 50 hours of art lovers.